Ultra-High-resolution, wall-size (Powerwall) displays are constructed using an array of TFT panels or projectors. 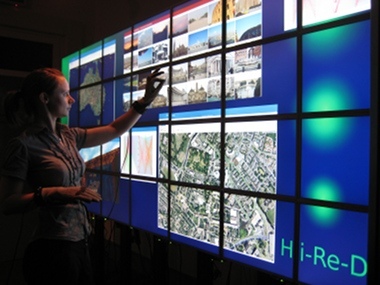 The vast screen real estate presents new ways in which we can view and interact with data. This workshop is not just for academics working with large screen displays, but also for practitioners who wish to discuss large scale data problems that can benefit from this new and growing research area. Due to CHI being in Paris, we are able to host the workshop at Univ. Paris-Sud and INRIA in front of their WILD Powerwall display (http://insitu.lri.fr/Projects/WILD). Throughout the day, the display will provide participants with a physical medium for discussing research and presenting work. 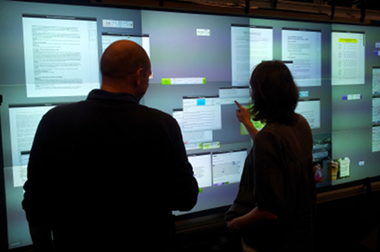 Participants will also be invited to demonstrate their own research on the display. An outcome of the workshop will be a wiki-site that acts as a shared resource for guiding others on how to design, build and install Powerwall displays. The submission deadline is Friday 18th January 2013, and notification of acceptance is Friday 8th February 2013. Please send submissions and inquiries to c.rooney@mdx.ac.uk. At least one author from each accepted paper must attend the workshop. Attendees must register for the workshop and for at least one day of the conference.